Andy Ockershausen: This is Andy Ockershausen, this is Our Town, and I have a great pleasure to talk to the great Tom Quinn today. For those of you who don’t know, he is a man, the first one started with the Air Marshals. Tom Quinn led that effort to put air marshals on airplanes. Is that right, Tom? Tom Quinn: That’s right, Andy. I came back into government to stand up the Federal Air Marshal Service as a federal law enforcement organization, based on the National Transportation Security Act that was passed after 9/11. Andy Ockershausen: And so you had to start from scratch to hire people, to provide protection on American aircraft. Did you do any foreign aircraft too, or just US? Tom Quinn: Just US-flagged air carriers and there was a small federal air marshal contingent that was … they were security officers in the FAA, very small number. On 9/11, there were 33 and that’s all. Andy Ockershausen: In the whole flying industry, 33 marshals. Tom Quinn: 33. And the mandate was to create a Federal Air Marshal Service of several thousand to provide a deterrent on US-flagged air carriers, both domestically and internationally. It still is a robust organization today. Andy Ockershausen: How many marshals would there be today? Tom Quinn: The number’s classified, but suffice it to say, there are several thousand operating from field offices that we created, all over the country. And their mission is essentially to promote confidence in federal aviation through the deployment of federal air marshals to detect, deter, and defeat hostile acts on aircraft, airspace, and airports. Andy Ockershausen: It must be one of the more successful ventures ever attempted by the federal government because, and maybe I’m wrong, but I don’t recall any hijacking since these marshals have been in place. Tom Quinn: Well, there certainly hasn’t been any hijackings. They are a significant deterrent along, with the rest of what TSA does in terms of the screening. None of us like it, but it is a fact of life if you’re going to fly. And the Federal Air Marshals really is the law enforcement component of that. Andy Ockershausen: Nobody’s ever done it before, correct? You didn’tt have any model to follow. Tom Quinn: And, you know, how do you go about … Most federal law enforcement agencies, the Secret Service, for example, the FBI, if they had a thousand agents to hire in a year, it would be a monumental task for an established organization. We were a new organization with little or no management, no field offices, and no leadership in the field offices initially. Tom Quinn: No experience and no one. There was no one to have any experience. Tom Quinn: And be able to … We were selecting, hiring, training, deploying several hundred a month. Andy Ockershausen: Tom, you came originally out of the Secret Service or FBI? Tom Quinn: Secret Service. Bite your tongue, Andy. Andy Ockershausen: With all your companions, we know them all. But Tom, let’s go back to the beginning. You are a native of the area in some respect. You went to high school here. I know you went to college here. Andy Ockershausen: You applied. Was there a recruiting program at the time? Tom Quinn: Well at the time, they were in the middle of a presidential campaign, and and if you recall that period in ’68, in June of ’68, Bobby Kennedy was a candidate. He was assassinated in Los Angeles. The Secret Service at that time did not protect candidates in election years. And so they were immediately called into action to begin protecting all of the candidates in ’68. Andy Ockershausen: Of both parties, of all parties. Tom Quinn: Absolutely. All of the candidates. And so, by the time the election in November ’68, the inauguration January of ’69, those agents were actually characterized as having the same impact as having been at war, that they were totally burnt out. They had been away from home working seven days a week, 12, 14, 16 hours a day. So the Service actually was able to expand and hire and I was part of that first wave of hiring in 1969, that came into the Service after the Congress passed the law for the Secret Service to begin protecting candidates. Andy Ockershausen: Did you go to school then down at the Quantico? Was that in progress then? Tom Quinn: No. Secret Service in those days had its own Treasury training, Treasury law . . .because the Secret Service is the oldest investigative agency of our government created at the end of the Civil War to subvert counterfeiting of US currency. It was not until 1903 that they began protecting presidents and Teddy Roosevelt happened to be the first. And he was a vice president and the president at that time was assassinated. Andy Ockershausen: Yeah, and Teddy moved up. Tom Quinn: Yeah. So that really began protection in the Secret Service. Andy Ockershausen: They were really after counterfeiters originally, correct? Tom Quinn: Absolutely. It was all about counterfeiters. Today, the investigative responsibility of the Secret Service remains. It’s a very significant part. I would contend that you can’t effectively protect presidents of the United States, vice presidents and others, without first having that criminal investigative experience, developing street smarts and know-how to deal with criminals on the street. That is an essential ingredient in protection, even today. Andy Ockershausen: But you’re out in front of it. You don’t wait for it. The Secret Service wants to find out about it before it happens. Andy Ockershausen: Get out in front of it. Andy Ockershausen: I knew that, Tom. You’ve been gone from Our Town. Where have you been? You’re over helping the Saudis. Tom Quinn: But the big difference is in the Kingdom of Saudi Arabia, they have a very effective force, but they don’t have the advanced survey skills or dedication to those skills that the Secret Service does. And that’s really the big difference. Andy Ockershausen: Well, but you left, you were recruited or had you retired from the Air Marshal Service? Tom Quinn: Well, I retired from the Secret Service in 1989. Tom Quinn: Went into private industry. Andy Ockershausen: That’s only 20 years. Tom Quinn: Had my own company through the ’90s and worked in the international protective security and training arena, did a lot of work in Saudi Arabia, had good US clients, but also had some principles in Saudi Arabia that were clients. After 9/11, I came back into government. I was asked to come back to stand up the Federal Air Marshal Service and I agreed to do it. So had to jettison my own business. Andy Ockershausen: Wow. You were ready for that, too, Tom. You did a lot of exploratory work before that, had you not? Tom Quinn: I felt like that I really had the experience to come in, both government, law enforcement, and business, to begin to create an effective organization. Still had a lot of close friends in law enforcement. In fact, right after 9/11, I actually went back to the Secret Service for three months. The director of the Secret Service on 9/11 was Brian Stafford, close personal friend. We had worked together in the Secret Service. Andy Ockershausen: I know Brian and Carpenter and all those who were the same class, right? Same group. Andy Ockershausen: Famous name. He’d love to hear that, wouldn’t he? Tom Quinn: So I came back into the Secret Service as a contractor to participate in a commission, internal commission, that the director, Director Stafford set up. And I worked on that when TSA and the Federal Air Marshal Service, the law creating them was passed. John Magaw was the first administrator and John was a contemporary of mine in the Secret Service. He had been former director of the Secret Service, and he reached out to a number of his former colleagues, ask us to come in and help him. Andy Ockershausen: Well, you guys had a lot of experience to bring to the table. But actually starting up a new thing with the air marshal, to me, is a prodigious accomplishment because you saved America from embarrassment and we didn’t have any more hijacking. Well, I don’t even recall any real serious problem, because people who got on airplanes were very thankful that somebody on that airplane was an air marshal. That to me was very comforting. Tom Quinn: Well, the fact of the matter is that with the number of flights every day in the US and internationally on US-flagged air carriers, I mean it’s roughly 28,000 a day in the US, you could never cover every aircraft, but we had air marshals on a significant number of flights. You never knew which ones. Andy Ockershausen: And you did it in front way out because you’re trying to prevent rather than stop. Right? Tom Quinn: Absolutely. It’s meant to be a deterrent, where you never know exactly what flight they’re going to be on, and it’s never a single air marshal. It’s always a team. Andy Ockershausen: Well, speaking of team, you’re the captain of the team and Tom Quinn, we’re so delighted that you’re on Our Town. We’re gonna take a break here now, and I’m going to talk to you about your career, not in the service. This is Andy Ockershausen. This is Our Town. Announcer: Technology truths, brought to you by GEICO. Announcer: Truth. You have 14 login passwords. And you can’t remember any of them. Man: Doug one. Doug two? Doug is awesome. Doug is awesome one, two, three. Announcer: Truth. It’s so easy to switch and save on car insurance at GEICO.com. Man: Doug is super cool ampersand, underscore, exclamation point, exclamation point, 1985. Knew it! 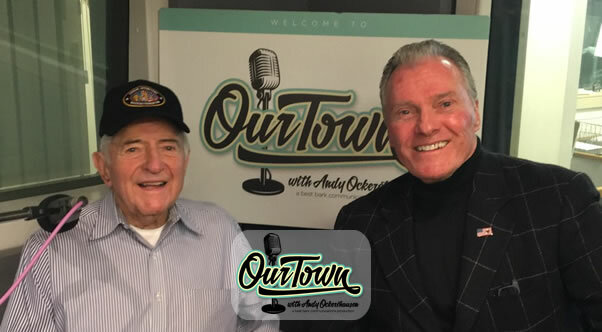 Andy Ockershausen: This is Andy Ockershausen, Our Town, talking with Tom Quinn, a major part of Our Town, but he’s a local guy. Grew up in suburban Maryland, born in the city, but moved to suburban Maryland. Right, Tom? Tom Quinn: That’s correct, Andy. Tom Quinn: High school, DuVal high school, class of ’64, matriculated University of Maryland. Took me a little longer than most to get through. I worked two jobs while I was in college. Andy Ockershausen: Maryland, do they have a criminal course? Or not a criminal course but criminology, or anything at University of Maryland? Andy Ockershausen: But he was not a Secret Service, was he? Tom Quinn: -years before, short career, five years as a deputy US Marshal. But his closest friend was a career Secret Service official. Andy Ockershausen: -He knew from firsthand experience of your friend. Andy Ockershausen: But how in the world, then, did you transition into doing, you never were CIA were you? Andy Ockershausen: But you had relationships all over the map, of course, being Secret Service. And has that led you to get clients out of, offshore, after you retired? I guess these contacts were invaluable. Tom Quinn: They certainly were, plus, probably one of the most significant times in my own career, I was assigned to the officer training, first as an instructor, then later as a Deputy Assistant Director. And we were creating Secret Service counter-assault teams at that period of time, explosive detection canine teams, and we were furthering the Secret Service counter-sniper unit, really growing it. And, I stumbled across a small group at Fort Bragg, North Carolina that was creating Delta Force. Charlie Beckwith. Andy Ockershausen: Way back when. Andy Ockershausen: These were all preventive people, correct? Andy Ockershausen: To do the job ahead of a crisis. Tom Quinn: And that’s really what the Secret Service is all about. The Secret Service, from a protective point of view, is all about preparation. Doing the advance and then putting the agent out there as the inner perimeter protecting the president, vice president, and others. And you essentially are in a dangerous game trying to make certain that nothing happens. Agents today feel that, deep down in their guts. And my son, as I mentioned, is 21 years on the job in the Secret Service today. He gets it. Andy Ockershausen: Is he in a field office here? Tom Quinn: Currently, he’s in the Office of Protective Operations. He’s a Special Agent in Charge, and he is my hero. He’s a guy that, great leader. Andy Ockershausen: You taught him good, Tom. Tom Quinn: He understands the basic pillars of leadership that most don’t. I refer to it as TTMC-squared over WWF. Truth, trust, moral clarity, moral courage, and walk without fear. TTMC-squared-. Andy Ockershausen: I love that. Tom Quinn: WWF. Too many people in business and government today, especially in government, they don’t understand walking without fear. They’re afraid of their next promotion or who’s going to say what about them. And real leaders must walk without fear. Andy Ockershausen: They got to be out in front, with no question. Tom Quinn: And you have to understand how important truth, and there is no trust without it. And moral clarity, you have to understand how to determine those very difficult gray areas. And then, most especially, you have to have the moral courage to do the right thing. Andy Ockershausen: You’re so right, Tom. And this is a great conversation. Your son, he got a great teacher obviously, so he learned from the knee, right? He learned from the voice of experience. We’re gonna come right back. We’re gonna take a break here and I’m going to come talk to Tom about his private life. We’ve only talked to him about his federal or government life. This is Our Town. This is Andy Ockershausen. [Begin Commercials]Tony Cibel: Hi. Tony Cibel here to tell you about Tony & Joe’s, and Nick’s Riverside Grill at Washington Harbour in Georgetown. Spectacular new restaurants. We’ve spent a lot of time rebuilding. You’ll love it. It’s really fantastic. For any information, you can go online to tonyandjoes.com. It’ll be a wonderful experience for the whole family. Call 202-944-4545 to make reservations. Everything is fabulous. You’ve got to come down and have some wonderful food. Charles Mann: Hi, I’m Charles Mann. For athletes like me, playing every down in a pro game is like getting a car accident. After years of playing football in Washington, my body is broken. I’ve had countless surgeries and joint replacements. I’ve been looking for a nonsurgical treatment since I ended my career. I heard a radio ad for a seminar about alternative treatment. It’s called Regenerative Medicine, which stimulates your own body to heal and repair itself. No surgery. No more pain. That got my attention. Announcer: You’re listening to Our Town with Andy Ockershausen. Andy Ockershausen: This is Andy Ockershausen talking to Tom Quinn about Our Town and a significance of 9/11 that we all lived through, Tom. That was almost a very, very, very tragic, it was tragic in some ways, but it could have been a lot worse. But the Service stood tall that day. Andy Ockershausen: I’m sorry, I meant, that’s the one. Tom Quinn: That we lived through, that if you were of high school age or older, you remember exactly where you were and what you were doing. In the case of President Reagan, it’s a very good example of the training of the Secret Service, how to react and respond. On that day, March 30th, 1981, the working inner perimeter of the shift immediately covered and evacuated. Jerry Parr, Ray Shaddock, pushed the President into the limo. Tim McCarthy was part of the working shift as an agent. He was shot. Tom Quinn: The other agents, both Presidential Protective Division, and the field office agents, Danny Spriggs and others, they were assaulting the assailant. They were guns out, guns drawn. Bob Wanko had the Uzi submachine gun out of the briefcase. They were going standing tall to the assailant. The Mil-aide in uniform, you might recognize if you reviewed the video, his first reaction was to hit the ground. That’s not a criticism, that’s his training. That’s the military training to hit the ground. Secret Service training is to cover and evacuate and, within arms reach, go after the assailant, which is what they did. Andy Ockershausen: And it paid off with Parr pushing him in, saved Ronald Reagan’s life. Got him to the hospital. Said, “Don’t go to the White House. Let’s go to George Washington.” He knew Our Town. He knew how close that was. Andy Ockershausen: And they called there, and GW was waiting for him. Andy Ockershausen: Rolled him right in. Tom, you’ve had such a wonderful, wonderful life and a great career, which is certainly not over, but one of the things that has always impressed me about you, Tom Quinn, is that you spend a lot of time on your motorbike. You’re riding with some dear friends of mine, like Jim Vance and the best Pete Wysocki. You guys rode some places, didn’t you? Tom Quinn: We did, indeed, Andy. We had, I had the pleasure of riding with Pete and Jim on occasion, and with Pete many, many times. And Pete rode motorcycles just like he played football. He was the wedge-buster in football and a great one, and on a motorcycle he rode a BMW 1100 RT and he rode it like it was a Ducati. And we had – one ride comes to mind. We started at my house in Reston and we were heading to a friend of mine’s place in the mountains of West Virginia. And there were eight of us riding, including Lyle Lovett and his father, Bill Lovett, both of whom were very accomplished motorcycle riders. Andy Ockershausen: Wow, I didn’t know that! Never heard that before. Tom Quinn: Lyle had grown up riding motocross and he was outstanding. The local Harley dealership, Rockville Harley Davidson and Battley Cycles manager, Tom Buzas, he provided a Road King Harley Davidson to Bill Lovett. Andy Ockershausen: Where was this distributorship? Tom Quinn: It’s in Rockville, Maryland. Andy Ockershausen: In Rockville. Gotcha. Tom Quinn: And this was Reston, Virginia, but Tom Buzas came with a Ducati for Lyle and one for him. And he rode with us, and it was a three or four day trip. And I’ll never forget, our first stop out of Reston was Middleburg, Virginia. We stopped for breakfast, and Lyle and Tom Buzas and Pete, they couldn’t wait to get on their sport bikes and hit those twisty single lanes through the mountains. And I knew we wouldn’t see them again ’til lunch and we didn’t. We were on our Harleys. Had lunch at a McDonald’s. Lyle comes over to me and he says, “Tom, you got to talk to Pete. He’s gonna kill himself.” He was trying to keep up with the two of them on their Ducatis that had been riding for 25, 30 years experience. Pete had about a year at most of riding a motorcycle, but he was so competitive, he was going to stay with them even if there were 18-wheelers coming the other way. He was going to be there. Andy Ockershausen: When he got into things, he went in all the way. I know that. Tom Quinn: He did. We had a number of rides. We did Daytona together. We took the train out of Lorton. Andy Ockershausen: Put your bikes on the train? Tom Quinn: Put our bikes on the train, got off in Sanford, Florida, did Bike Week. Tom Quinn: And Pete was always a great guy to be with and be around. I miss him to this day. It’s been 15 years. Andy Ockershausen: We never go a day without talking about Pete, Janice and I, because we worked intimately. He was such a loyal guy, and I’ll never forget that. We had a television show that Pete had done a show for, Channel 50, and we didn’t know what they’re gonna do. So I jumped in and said, “We’ll do it, we’ll do it Comcast and we’ll do a great job.” We’ll throw channel 20 out. We were channel 50, we throw out channel 20. So they then decided that they want to do the show, and they approach Pete and George Stark. But Pete was the boss and they said, “Pete, we’re going to give you a lot more money.” Pete said, “No, no, I’ve given my word to Andy. We’re gonna do it with Channel 50.” I’ll never forget that. That kind of loyalty in our business was kind of tough ’cause people would move for money. Money didn’t move him. Tom Quinn: No. Pete was a very loyal guy, and Pete loved the foundation that I’m a part of now, The Special Operations Warrior Foundation. I’ve been on the Board for the last 15 years. The foundation was created in 1980 after the ill-fated attempt to rescue the Americans in Iran, commonly known as Desert One. It was the Eagle Claw operation. Well, that ill-fated event in the desert, where we lost the Marine helicopter aviators and some Air Force aviators on C130. From that, there was a foundation created, Special Operations Warrior Foundation, to educate those children. That foundation today, we have 163 children in college right now. Andy Ockershausen: That’s a powerful thing for these guys, right? Andy Ockershausen: The best and the brightest. They’re right at the head of the spear. Tom Quinn: That’s right. That’s exactly right. Andy Ockershausen: You got Pete helping you and he helped everybody. And, I would never, and Janice and I know that. We never would ask Pete for any favor what we were doing for the public and personal appearance. He always stood tall. We just had a wonderful wonderful relationship. He did the same thing when he was doing dogs. Remember? That was his passion for a while, the dogs. Tom Quinn: The dogs or sailboats. Janice Iacona Ockershausen: The bongos. Tom Quinn: The bongos. But you know, John Riggins is another wonderful guy. John has come to, and participated in, the Special Operations Warrior Foundation as an advocate. Tom Quinn: He sure has. Andy Ockershausen: He’s a good guy, and his wife used to work for us right here at WMAL. We were real close to that thing, but Pete and all of you guys doing that riding were so special, Tom. I hope you keep it up now. You probably don’t ride as much as you used to. Andy Ockershausen: Well, my son, I don’t know whether Jim Wells told you that, was a Harley dealer, East Coast Harley down in Dumfries, down near Quantico. He made so much money he sold it and left and moved to Nevada. Tom Quinn: Andy. . .
Andy Ockershausen: He made so much money. Tom Quinn: My first new motorcycle I purchased from Keith Ockershausen. Tom Quinn: At Triangle Harley Davidson. Andy Ockershausen: Yeah. Then it became East Coast, right. Tom Quinn: Yeah. It was a 1996 Road King and he must’ve thought I was silly ’cause I went in there a year before to buy a motorcycle. He said, “You can come back in January and give us a deposit, and we might have one 10 or 11 months later.” I didn’t realize they were that much in demand. Andy Ockershausen: Oh, the demand was incredible at one time. The company got in trouble but the dealerships were always healthy. Tom Quinn: But please tell him I still have that motorcycle. Andy Ockershausen: That’s his son right there. That’s my grandson with the beard and he was just with his father, with Kurt, for Thanksgiving. Now we got him for Christmas. Tom Quinn: Yeah, I said Keith. It’s Kurt. Andy Ockershausen: With the children and the grandchildren. But Tom, this has been such a pleasure. You are an icon of what you have done and a hero of the marshal service, which I know. And that was, you know, a work of love for you. It had to be because you started from scratch. You had no play to follow. You had to start, ad-lib everything, didn’t you? Tom Quinn: Tremendous respect for those that came from other federal law enforcement agencies to help stand up the Federal Air Marshal Service, and to all of those Federal Air Marshals that understand what it’s like being at 30,000 feet, felony in progress, you can’t back out, there’s no backup. You got to do your job. Andy Ockershausen: You’re on your own. You’re responsible. The pilot’s not even responsible anymore, you are, for that aircraft. Tom Quinn: For the flight crew and for the flight deck crew. Andy Ockershausen: Well, we had an interesting experience and I don’t even bring this up because Janice and I went through it together. We had an opportunity to visit to Israel, and we went in and just saw the sights and became enraptured of what has happened to that country. And we’re leaving and the guy at the gate, he was in uniform I believe. And I said “Do you want to go through these papers?” He said, “No, we know who you are.” I felt very good about that. Tom Quinn: The Israelis are very good. They’ve had reason to be through the years. Andy Ockershausen: Absolutely. They have every reason to be. Tom Quinn: It’s a monumental task. Andy Ockershausen: Oh, absolutely. Almost impossible task, but again, the proof of the pudding is, that it hasn’t happened. There’s been no hijacking since those days, and I think that is a powerful tribute to the Air Marshal Service and to the TSA, to everybody. It’s a team effort. It’s not just the guys in here, it’s the ones on the ground that help. Tom Quinn: It certainly is. Andy Ockershausen: Tom Quinn, you’re amazing and I hope you have a wonderful, wonderful ride the rest of your life. Missing Pete is not easy, as you talk about it. Janice and I talk about him every day, for so many reasons. We were very close and spent some time with him right before he died. There’ll never be another. Andy Ockershausen: She was wonderful, wasn’t she? Oh my God. Andy Ockershausen: Yeah. We went through that didn’t we, Janny-O? Tom Quinn, thank you so much for being our guest on Our Town because even though you live all over the world, you’re still part of Our Town. Andy Ockershausen: We’ve been waiting for you for two years. I’m glad that you brought all your tales back with you ’cause we need you. Tom Quinn, thank you very much. Tom Quinn: Andy, thank you and thank Janice. Announcer: You’ve been listening to Our Town, Season 2, presented by GEICO, our hometown favorite, with your host Andy Ockershausen. New Our Town episodes are released each Tuesday and Thursday. Drop us a line with your comments or suggestions. See us on Facebook or visit our website at OurTownDC.com. Our special thanks to Ken Hunter, our technical director, and WMAL Radio in Washington DC for hosting our podcast. Thanks to GEICO, 15 minutes can save you 15% or more on car insurance.